Planning a trip to the beach this summer? 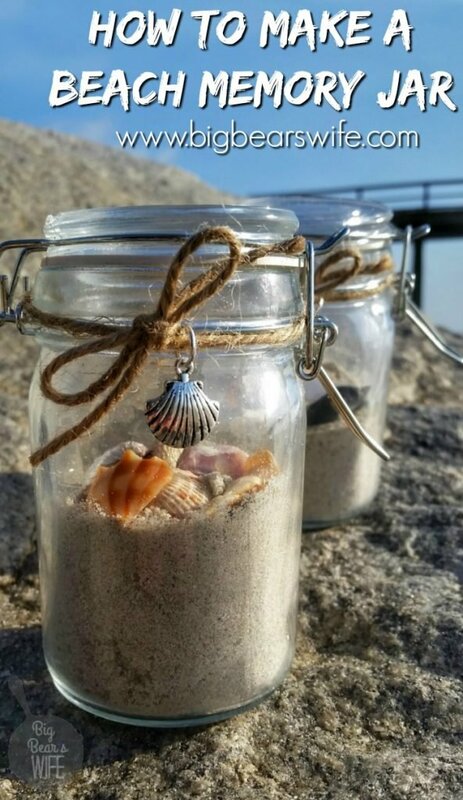 Take some time to collect a few seashells and a little sand to create your own personal DIY Beach Memory Jar vacation souvenir. After six days of refreshing my mind and breathing in the salty air of Carolina Beach, I’m back in Virginia for a few weeks. I needed that little break! Even though I came back home to a ton of stuff to do. I’ve got more deadlines that I can count and an endless to-do list while I get ready for my future sister-in-laws bridal shower, I’m glad I had those few days on the coast. Going to Carolina Beach and Wilmington is so much more than just going to the beach or going on vacation for me. When I leave Virginia and head to Wilmington, I get to spend time with friends (that are really like family)! I’m normally with Nikki and David , I get to visit with Toni and Sydni, I get to see Melissa and her kiddos (that live there) and I spend the majority of my time playing on the beach with my god-daughters Alyssa and Kendra. You see, just any ol’ beach won’t do for me; it’s got to be Carolina Beach. So this year we decided to make our very own personal beach souvenirs. After we had spent a few days on the beach and collected a bag or so of seashells, Alyssa and I ran over to the craft store to grab a few things. 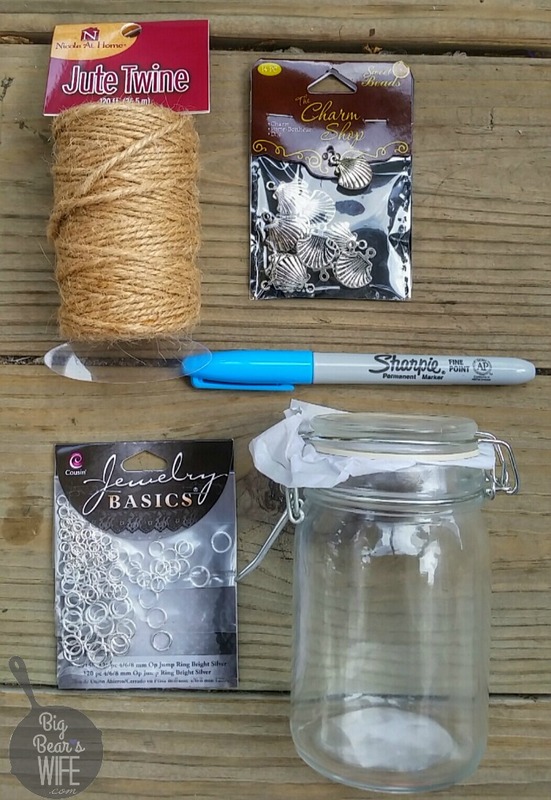 We picked up a few jars, a sharpie, some charms and a roll of twine. We made these little Beach Memory Jars as our own little vacation souvenirs for our 2016 Carolina Beach trip. I just love them. 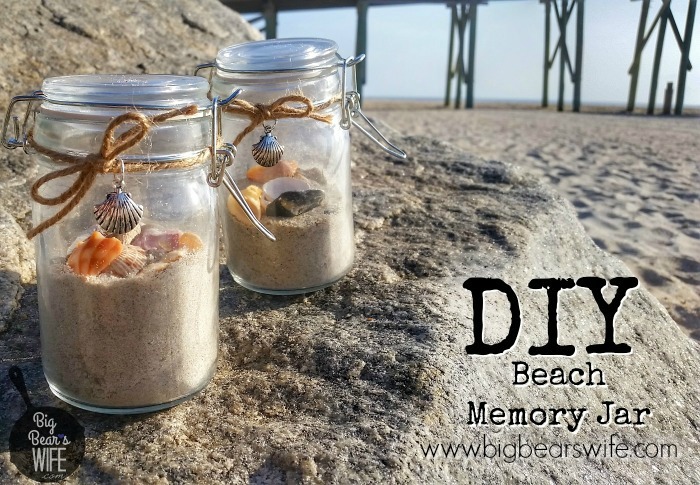 So this is what you’ll need to make your own Beach Memory Jar vacation souvenir. Glass Jar and Lid – You can use any glass that you like. I picked a tall smaller jar with a hinge lid but the girls picked out medium fat round jars for theirs. You could also use a mason jar. You can find jars like this at the craft store or the dollar store. A Sharpie – Use any color. We used a teal colored sharpie for ours but black would have probably shown up better. Beach Themed Charm – We used a seashell charm for ours but you could also use a mermaid charm, a starfish charm, a lighthouse charm or anything you love. You also don’t have to use a charm at all, it’s your memory jar so make it how you want it. Twine – This is also an option part of the memory jar but I think it looks really “beachy” so I added it to mine. You can find this in the craft store, normally in the ribbon or floral sections. Small/Medium Jewelry Jump Rings – These help string the charms onto the twine. You can find these in the jewelry section of most craft stores or you can order them online. 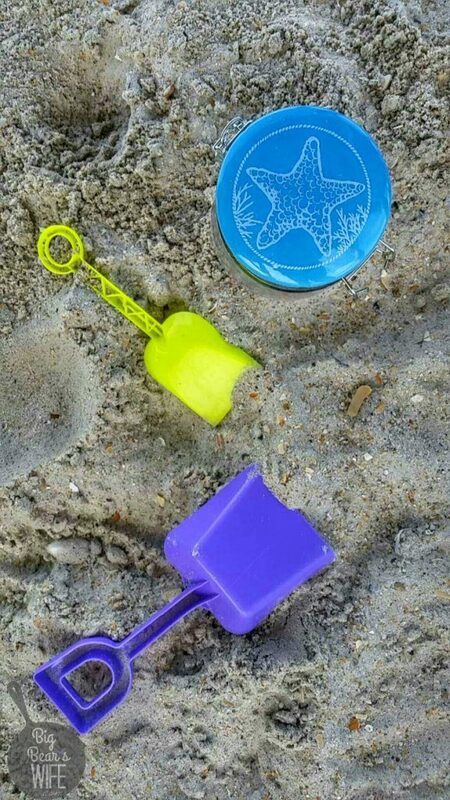 Sand – Depending on the size of the jar, you’ll need somewhere between a cup and half a cup of dry sand. 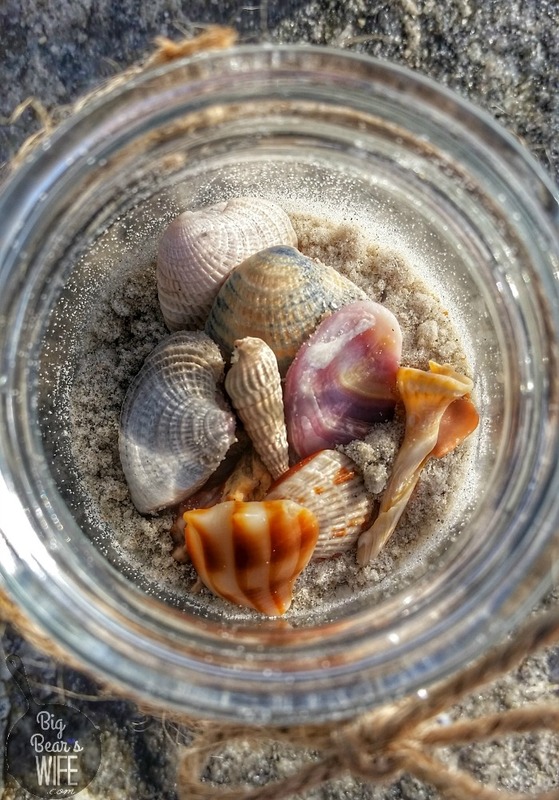 Seashells – The size of your seashells will also depend on the size of your jar. 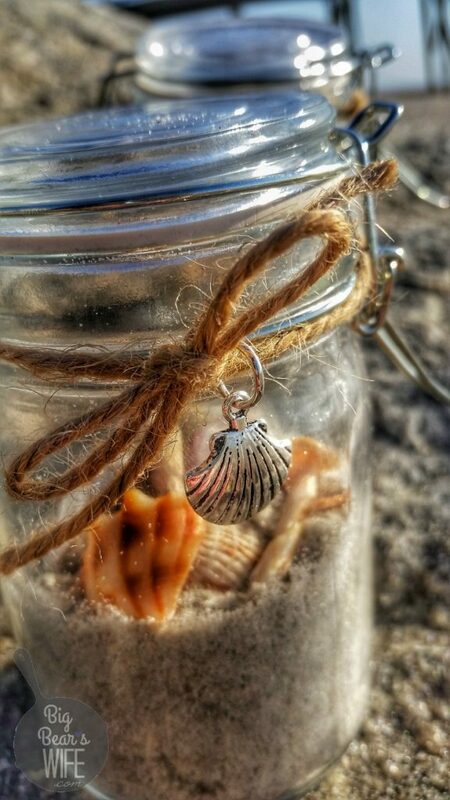 Since I used a smaller jar for mine, I used mini seashells that I found on the beach. My god-daughters used a bigger jar for theirs so they added quite a few larger shells to their jars. 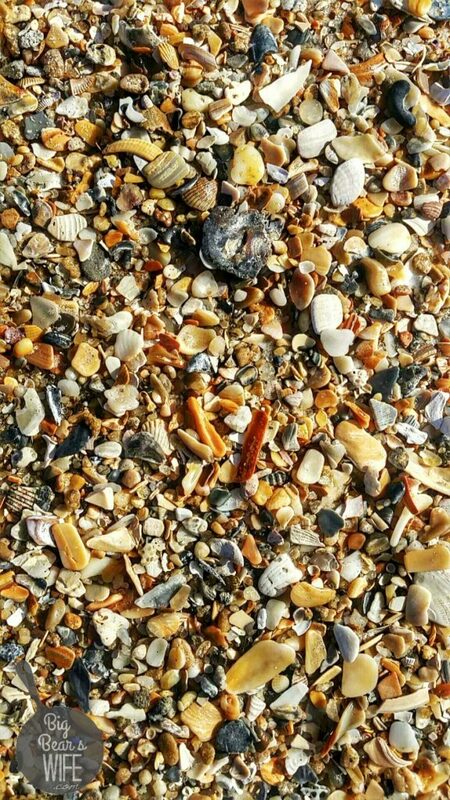 If you can go in the morning to look for seashells, do it. You can still find seashells in the middle of the day or late afternoon but they’ve already been out there all day, they’ve been picked over by lots of people. I also found a lot of my little seashells in tide pools this year. Up on the North end of the beach, there were little tide pools and while the ocean waves did roll into them they were far enough up on the beach and deep enough where the girls could play in them without me having to worry about them getting pulled out to sea and when I sat down in them, the water came up to my shoulders. I also liked them because I could see the bottoms of the tide pools; I’m not a fan of being in water when I can’t see the bottom haha. But anyways, I just sat down in the tide pools while they played and the bottoms were covered in time seashells. 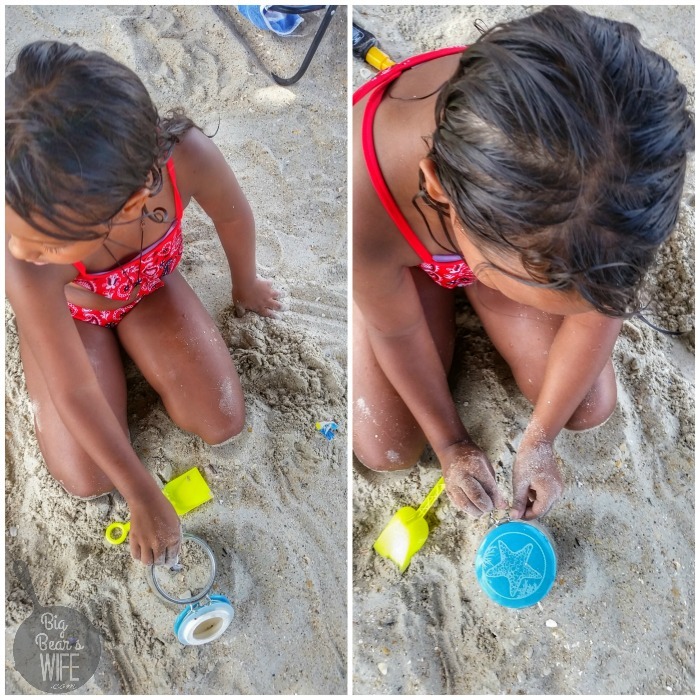 I found mini conch shells, mini scallop shells and mini olive shells just sitting there while the girls played. 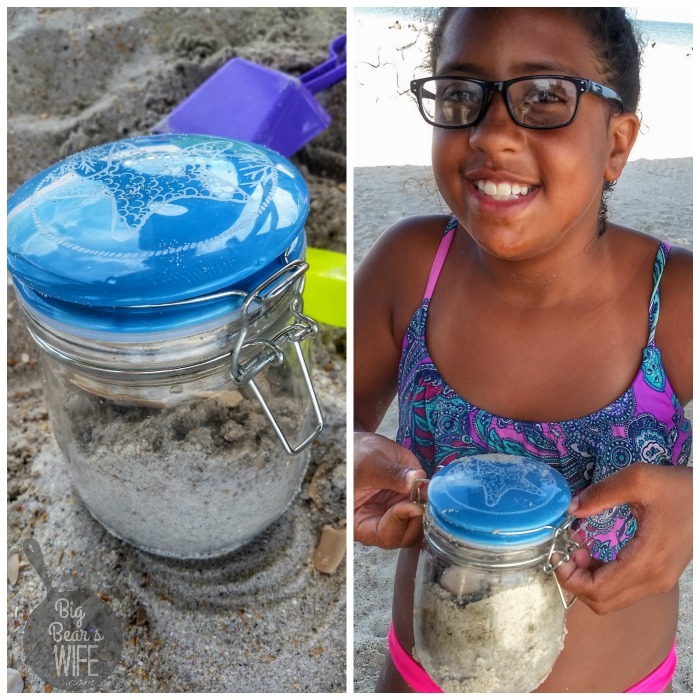 Once you’re ready to make your beach memory jar, flip the jar upside down and write the date and beach on the bottom of the jar with a sharpie. Measure your twine around your jar, leaving enough extra to tie a bow. Once you’ve cut your twine, thread your charm onto it. This is where you’ll need the Small/Medium Jewelry Jump Rings. Open the jump ring and add your charm to it, close the jump ring using your fingers (or pliers if you can’t close it with your fingers). Add your charm to your twine and tie the twine around the jar; I tied mine right below the lid when the jar is closed. Next Add your dry sand; fill it up as little or as much as you’d like. Then add your seashells; just like with the sand you and add as many or as few as you want. Close the top up and you’re done. You’ve got your very own, personal beach vacation souvenir.